WASHINGTON, D.C. -- A majority of Americans, 53%, approve of the job the Supreme Court is doing, the highest rating since 2009 and a slight improvement from September's 49%. The latest reading on the nation's highest court follows several controversial rulings by the court last month at the end of the 2017-2018 term, as well as President Donald Trump's nomination of conservative judge Brett Kavanaugh to replace retiring Justice Anthony Kennedy. The poll was conducted July 1-11 while Trump deliberated on and then nominated Kavanaugh to fill Kennedy's seat. Prior to that, the Supreme Court handed down several decisions that have drawn the ire of Democrats. Among them, the court upheld the Trump administration's ban on travel from several majority Muslim countries to the U.S., ruled that workers who do not belong to public sector unions do not have to pay fees for collective bargaining and ruled that anti-abortion pregnancy centers do not have to give out information about publicly funded abortion services. 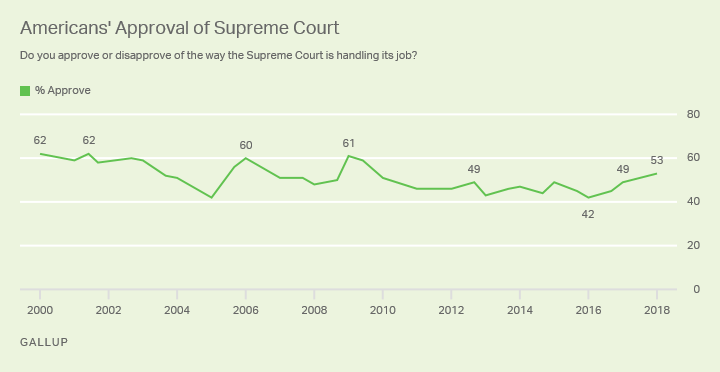 Gallup began measuring the public's views of the Supreme Court's job performance in September 2000 and found 62% approving in that initial reading. This was the highest rating to date, although matched by a June 2001 measure. From 2000 through 2010, approval of the court only fell below 50% twice -- a historical low 42% in June 2005 (following a controversial decision allowing broader government power to seize private land) and 48% in June 2008 (when the public was particularly negative about all three branches of government). Since 2011, approval of the court has ranged from 42% to 49%, until this year when it returned to the majority level. Republicans' and Democrats' ratings of the Supreme Court have each fluctuated over time seemingly based on decisions handed down by the court, changes in which party occupies the White House and the appointment of justices to the court. 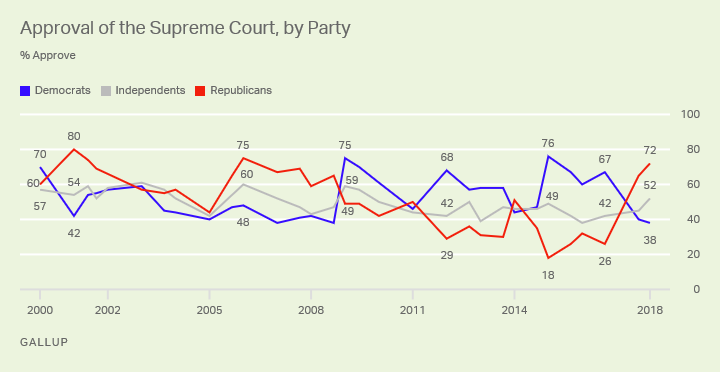 Republicans' approval of the court has been particularly prone to sharp swings in opinion. The largest fluctuation in their views came between September 2016 and September 2017, with a 39-point increase in approval from 26% to 72% following Trump's presidential win and his appointment of Neil Gorsuch to the Supreme Court. The current 72% approval rating among Republicans approaches the party's historical high of 80% from January 2001 after the Supreme Court's decision in Bush v. Gore effectively made George W. Bush president. Democrats, have proven to be reactive -- in opposite directions -- to the same factors as Republicans when rating the Supreme Court's job. Between September 2008 and September 2009, when Barack Obama became president and Sonia Sotomayor was seated to replace David Souter, Democrats' rating of the court increased 37 points, from 38% to 75%. Most recently, between 2016 and 2017, Democrats' approval dropped 27 points, to 40% and currently stands at 38%. Political independents' two-year, 10-point increase to 52% approval of the court has also contributed to elevating the court's overall rating. Historically, more Americans have described the Supreme Court's ideology as "about right" rather than "too conservative" or "too liberal." Currently, 44% say the court is about right (matching the historical average), 29% too conservative and 21% too liberal. The last four U.S. presidents have each appointed two justices to the high court during their presidencies. Less than halfway into his first term, Trump, like Obama before him, has already had two seats to fill, giving him the opportunity to shape the court's ideology for many years to come. Gallup data have shown that a president's political ideology as well as that of the justices he has appointed, affect the public's views of the court's ideology. During George W. Bush's presidency, more Americans said the court was too conservative than too liberal, particularly after he nominated two conservative justices. Likewise, throughout Obama's presidency, the public was more likely to describe the Supreme Court as too liberal than as too conservative. Over the past two years, with Trump in the White House, the too conservative view has again become more prevalent than too liberal. More than six in 10 of those who approve of the Supreme Court's job, 62%, think it is ideologically about right, while 53% of those who disapprove of the court think it is too conservative. Similarly, 52% of Republicans think the court is about right, but 55% of Democrats say it is too conservative. 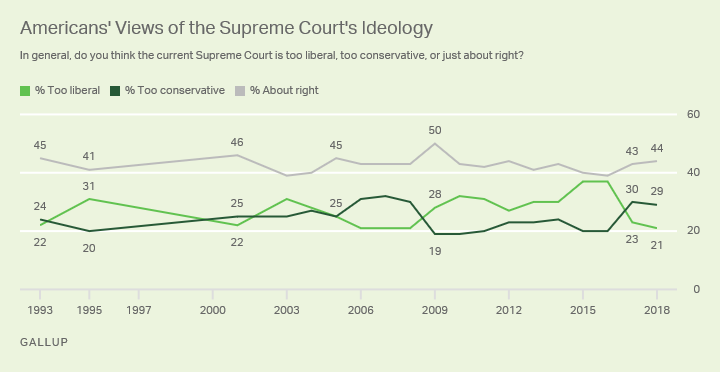 Americans' own ideology also colors their perceptions of the Supreme Court's ideology with nearly all conservative adults saying the court is either about right (49%) or too liberal (42%). Among liberal adults, 61% think the court is too conservative and 26% say it is about right. A slim majority of political moderates, 52%, think the court's ideology is about right and 30% too conservative. As the Senate prepares to hold confirmation hearings on Kavanaugh, approval of the current Supreme Court is in majority territory for the first time in nearly a decade, a result of an increase in Republicans' and independents' positive views. A conservative, Kavanaugh could shift the balance of power on the court if he is confirmed, and the result could be that Democrats and moderate and liberal Americans could become even less positive about the court than they are now. Americans' confidence in the U.S. Supreme Court is steady, with 37% expressing a great deal or quite a lot of faith in the nation's highest court. 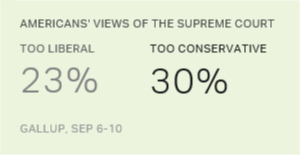 For the first time in nearly a decade, more Americans say the Supreme Court is too conservative than too liberal.